Is Chocolate Good For The Heart? While in Paris recently, allegedly researching the French Paradox, the skeptical cardiologist and his Eternal Fiancee’ participated in a Food Tour (Paris By Mouth). Along with 2 other American couples, we were guided and educated by a Parisian food/wine expert as we wandered from one small shop to another in the St. Germain district of the Left Bank. We collected the perfect Baguette Monge from Eric Kayser, delicious rillettes, terrine, and saucisson from Charcuterie Saint Germain, amazing cheese from Fromager Laurent Dubois, delightful pastries from Un Dimanche a Paris, and unique and delicious chocolate from Patrick Roger. The tour ended at La Cave du Senat wine shop, where we descended into a stone cellar and tasted all of the delicious foods while drinking wonderful wines. The French Paradox refers to the fact that the French are among the world’s highest consumers of saturated fat, but have among the world’s lowest rates of cardiovascular disease. For those nutritional experts still obsessed with the dangers of all saturated fats, this poses a conundrum. France consumes more cheese (27 kg per person per year) than any other country in the world (the US only consumes 16 kg per capita). Unlike Americans who have embraced low fat or skim versions of cheese, the French predominantly consume full fat cheese. I wrote In Defense of Real Cheese in 2014 and extolled the heart-healthy virtues of eating full fat , non factory-processed cheese. Perhaps the French are protected against heart disease by their high consumption and love of real cheese ? Whereas cheese contains saturated fat and has been unfairly stigmatized as unhealthy, chocolate, similarly with high saturated fat content, seems to have been coronated as the king of food that is yummy but paradoxically is also heart healthy. Could chocolate be the enigmatic protector of the hearts of the French? Back on Boulevard Saint-Germain we entered the shop of Patrick Roger, who won the coveted Meilleur Ouvrier de France, in the craft of chocolate in 2000. The MOF is France’s way of recognizing the best artisans in various fields and occurs every 4 years. The standards are so high that in 2015 none of the 9 chocolatier competitors were felt to merit receiving the award. 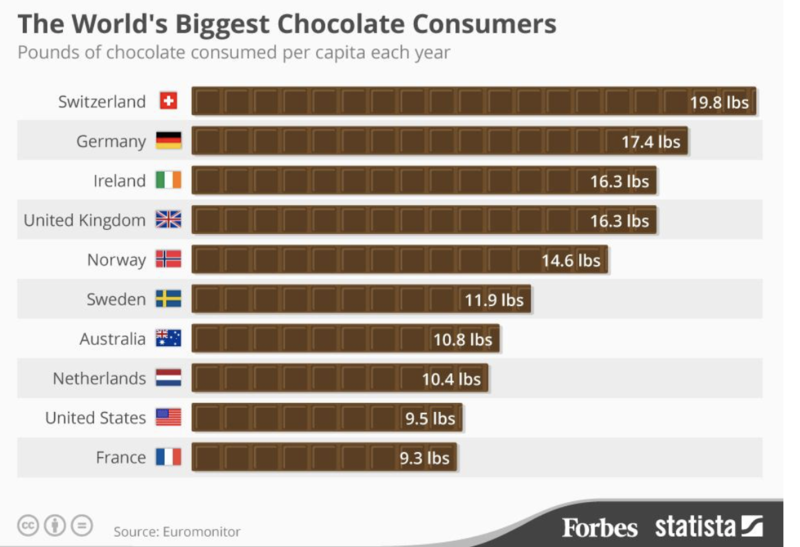 The French clearly take their chocolate seriously but they don’t top the international charts at per capita consumption. 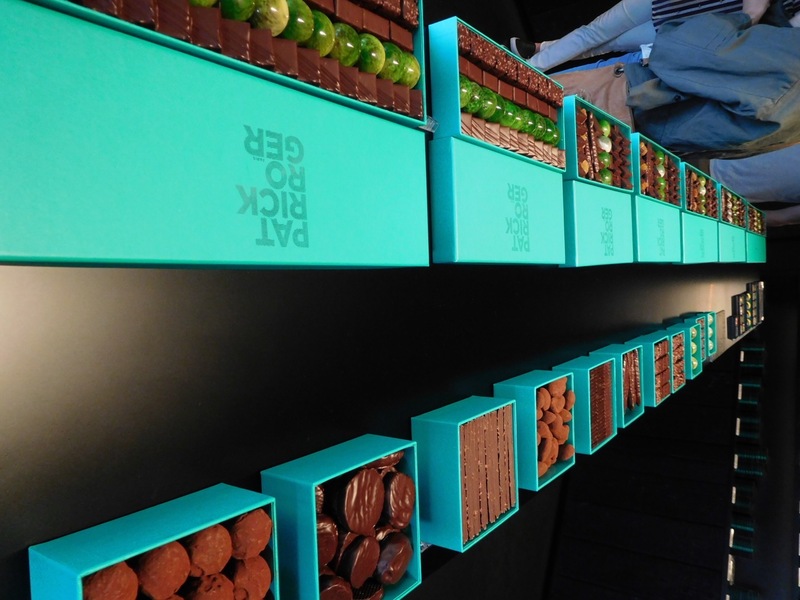 I’ve been meaning to write a post on chocolate and the heart since my encounter with high end chocolatiers in Paris and Bruges, and especially since May when there was much fanfare over a Danish study showing less atrial fbrillation in high chocolate consumers. Scientists tracked diet and health in 55,502 men and women ages 50 to 64. They used a well-validated 192-item food-frequency questionnaire to determine chocolate consumption. After controlling for total calorie intake, smoking, alcohol consumption, body mass index and other factors, they found that compared with people who ate no chocolate, those who had one to three one-ounce servings a month had a 10 percent reduced relative risk for atrial fibrillation, those who ate one serving a week had a 17 percent reduced risk, and those who ate two to six a week had a 20 percent reduced risk. Previous large, well done observational studies also show that high chocolate consumption compared to no consumption is associated with a lower risk of cardiovascular disease. 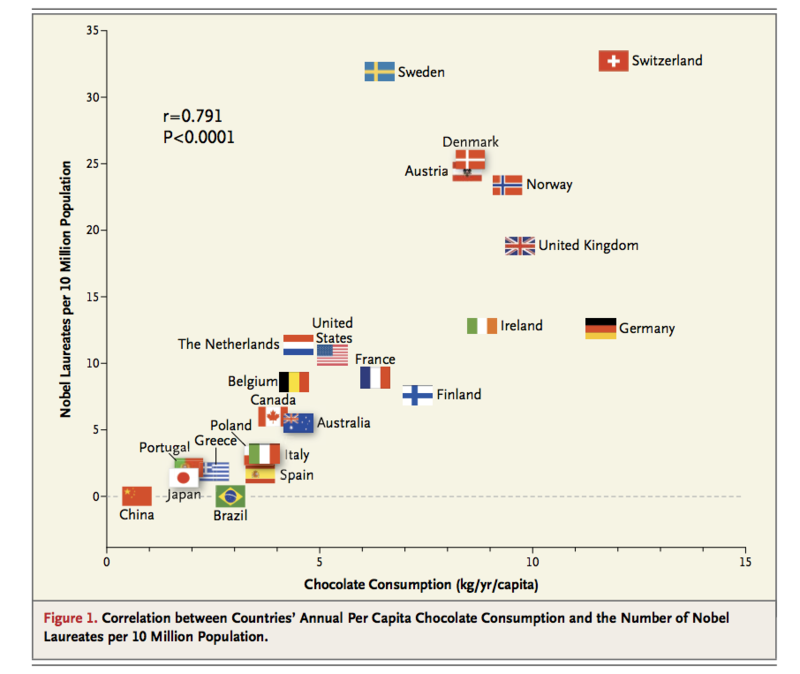 My favorite graph to hammer home this point is below and plots how much each country consumes in chocolate, versus the number of nobel laureates. There is a good correlation here (Pearson’s (no relation unfortunately) correlation coefficient or r value) which is highly significant (p value <.0001). But does anyone seriously think a country can boost its Nobel Laureate production by promoting chocolate consumption? Although we had extensive data on diet, lifestyle and comorbidities, we cannot preclude the possibility of residual or unmeasured confounding. For instance, data were not available on renal disease and sleep apnoea. However, after adjusting for age, smoking status and other potential confounders, the association was somewhat attenuated but remained statistically significant. We did not have information on the type of chocolate or cocoa concentration. However, most of the chocolate consumed in Denmark is milk chocolate. In the European Union, milk chocolate must contain a minimum of 30% cocoa solids and dark chocolate must contain a minimum of 43% cocoa solids; the corresponding proportions in the USA are 10% and 35%.16 Despite the fact that most of the chocolate consumed in our sample probably contained relatively low concentrations of the potentially protective ingredients, we still observed a robust statistically significant association, suggesting that our findings may underestimate the protective effects of dark chocolate. Here at Vox, we examined 100 Mars-funded health studies, and found they overwhelmingly drew glowing conclusions about cocoa and chocolate — promoting everything from chocolate’s heart health benefits to cocoa’s ability to fight disease. This research — and the media hype it inevitably attracts — has yielded a clear shift in the public perception of the products. Dark chocolate and cocoa products are rich in chemical compounds called flavanols. Flavanols have attracted interest as they might help to reduce blood pressure, a known risk factor for cardiovascular disease. The blood pressure-lowering properties of flavanols are thought to be related to widening of the blood vessels, caused by nitric oxide. Studies were short, mostly between two and12 weeks, with only one of 18 weeks. The studies involved 1804 mainly healthy adults. They provided participants with 30 to 1218 mg of flavanols (average of 670 mg) in 1.4 to 105 grams of cocoa products per day in the active intervention group. Seven of the studies were funded by companies with a commercial interest in their results, and the reported effect was slightly larger in these studies, indicating possible bias. moderate-quality evidence that flavanol-rich chocolate and cocoa products cause a small (2 mmHg) blood pressure-lowering effect in mainly healthy adults in the short term. Thus, for a very small drop in blood pressure you would have to make chocolate the main source of calories in your daily diet. Consuming such large amounts of chocolate, even dark chocolate, would drastically increase your sugar consumption. Further weakening any conclusions on the benefit of chocolate are that these are very short-term studies with markedly different baseline BPs, ages, and large variations in flavanol dosage. 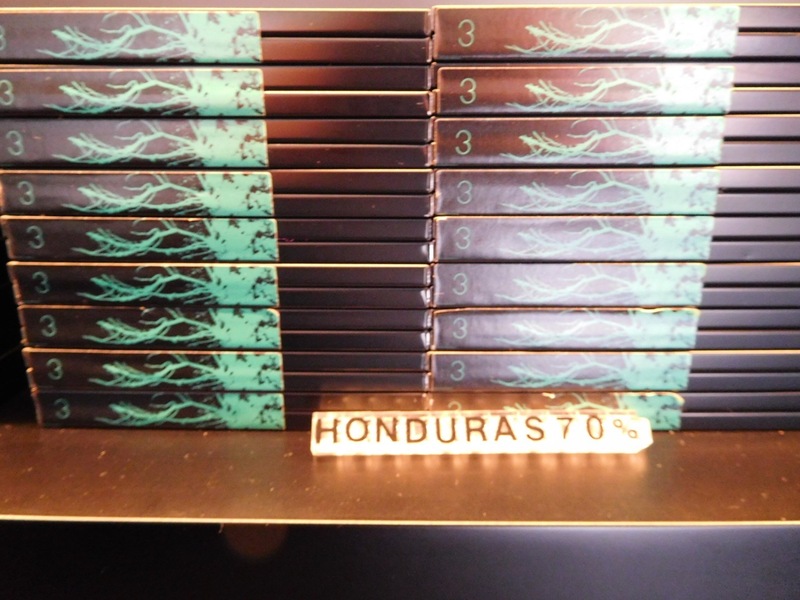 Is Your Chocolate Produced By Slaves? Tony’s Chocolonely is a Dutch confectionery company focused on producing and selling chocolate closely following fair trade practices, strongly opposing slavery and child labour by partnering with trading companies in Ghana and Ivory Coast to buy cocoa beans directly from the farmers, providing them with a fair price for their product and combating exploitation. The slogan of the company is: “Crazy about chocolate, serious about people“. I was previously unaware of the problem of child slavery and cocoa production. If you’d like to read more about it start here. The Tony’s Chocoloney was so tasty I ended up consuming vast quantities of it at the end of the day and it disappeared rapidly. Currently the skeptical cardiologist’s house is chocolate free. Should Chocolate Be Considered A Super Food or A Slave Food? I can’t recommend chocolate to my patients as a treatment for high blood pressure or to reduce their risk of heart attack or stroke on the basis of the flimsy evidence available. If you like chocolate, the evidence suggests no adverse effects of consuming it on a regular basis. 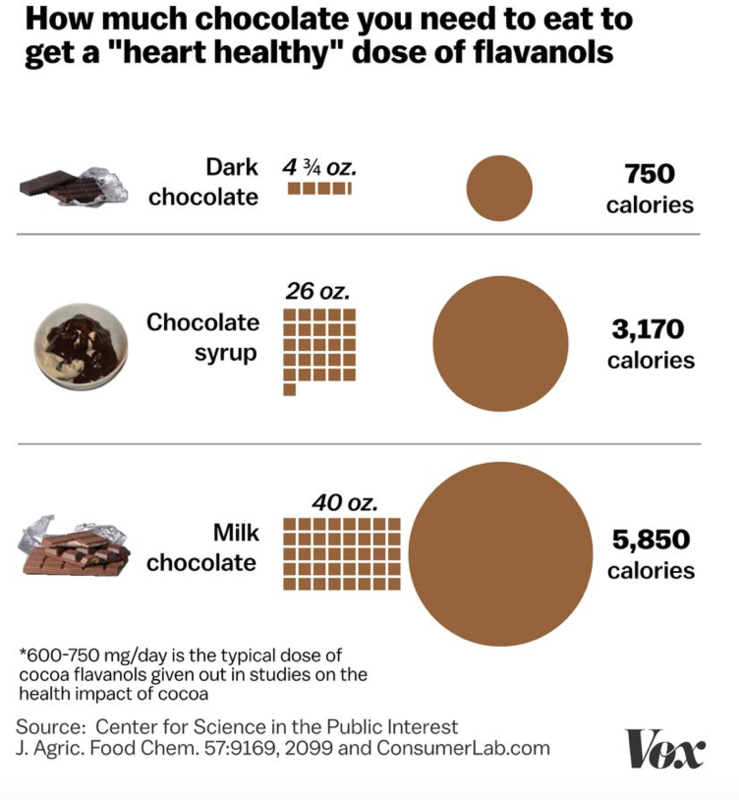 As far as flavanols obtained from cocoa and their benefits for cardiovascular disease, I eagerly awaiit the result of the ongoing Cocoa Supplement and Multivitamin Outcomes Study (COSMOS), a randomized trial looking at whether daily supplements of cocoa extract and/or a standard multivitamin reduces the risk of developing cardiovascular disease and cancer. Patients and readers should recognize that there is an ongoing research/media campaign by Big Chocolate to convince them that chocolate is a SuperFood which can also be a dessert. As the skeptical cardiologist surveys the heart health information available to his patients and the lay public, he sees two broad categories of misinformation. First we have the quacks and snake oil salesman. These are primarily characterized by a goal of selling more of their useless stuff online. I’ve described this as the #1 red flag of quackery. Usually I’m inspired to investigate these charlatans because a patient asks me about one of their useless supplements. The second category is more insidious: the magazine or internet news site seems to have as its legitimate goal, promoting the health of its readers. There is no clear connection to a product. Web MD, which I wrote about here, is an example of this second type. Hard copy versions of these types of media frequently make it into doctor’s waiting rooms: not because doctor’s have read and approved what is in them. These companies send their useless and misleading magazines for free to doctor’s offices, and the staff believe it to be legitimate. How does glaringly inaccurate and often dangerous information get into media that ostensibly has as its goal promoting its readers health? Most likely, it is a result of media’s need to constantly produce new and interesting ways for readers to improve their health. Clearly, readers will not continue subscribing, clicking and reading such sources of information if there isn’t something new and exciting that might prolong their lives: gimmicks, miracles cures, and “natural” remedies are more alluring than the well-known advice to exercise more, watch your weight, stop smoking and get a good night’s sleep. A patient recently brought in a printout of Reader’s Digest’s “40 things cardiologists do to protect their heart” which is typical of the second category. Reader’s Digest was a staple of my childhood. My parents subscribed to it consistently and I would read parts of it. It was small and enticing. Allegedly its articles were crafted so that they could be read in their entirety during a session in the bathroom. The magazine was founded in 1920, by DeWitt Wallace and Lila Bell Wallace. For many years, Reader’s Digest was the best-selling consumer magazine in the United States; it lost the distinction in 2009 to Better Homes and Gardens. According to Mediamark Research (2006), Reader’s Digest reaches more readers with household incomes of $100,000+ than Fortune, The Wall Street Journal, Business Week, and Inc. combined. Global editions of Reader’s Digest reach an additional 40 million people in more than 70 countries, via 49 editions in 21 languages. The periodical has a global circulation of 10.5 million, making it the largest paid circulation magazine in the world. Reader’s Digest used to run a recurring educational feature on the various body parts and organs of Joe and Jane which intrigued me. I am certainly no beauty. I weigh 340 grams, am red-brown in color and have an unimpressive shape. I am the dedicated slave of Joe. I am Joe’s heart. The health information in this series was generally accurate but the presentation lacks the kind of sizzle that apparently attracts today’s readers. Fact Check: following the links provided provides no evidence to support this claim. Too little or too much sleep are associated with adverse health outcomes, including total mortality, type 2 diabetes, hypertension, and respiratory disorders, obesity in both children and adults, and poor self-rated health. Another broke down mortality according to number of hours of sleep. Thus, in comparison to those who sleep 7 hours, those who sleep 5 hours have a 5% increase in mortality and those who sleep 11 hours have a 38% increase in mortality. These data are based entirely on observational studies so it is impossible to know if the shortened sleep is responsible for the increased mortality or if some other (confounding) factor is causing both. My advice: Some people do fine with 6 hours and 45 minutes of sleep. Some require 8 hours 15 minutes for optimal function. Rather than obsessing about getting a specific amount of sleep time, it makes more sense to find our through your own careful observations what sleep time works best for you and adjust your schedule and night time patterns accordingly. Fact Check. There is nothing to support CrossFit as more heart healthy than regular aerobic exercise (which the vast majority of cardiologists recommend and perform). Fact Check. There is a general consensus that stress has adverse consequences for the cardiovascular system. Evidence of meditation improving cardiovascular outcomes is very weak. Non randomized, non blinded studies with small numbers of participants have suggested a reduction in CV death in those performing regular TM. However, we need better and larger studies before concluding there is a definite benefit compared to optimal medical therapy. Thus far, the recommendations have been pretty mundane: exercise, stress reduction and a good night’s sleep is good advice for all, thus boring. In order to keep reader’s interest (and reach 45 things) Reader’s Digest is going to need to add seriously bad advice. This bizarre and totally unsubstantiated practice was recommended by Carolyn Dean MD, ND. What do we know about Dr. Dean? After being notified in 1993 that a disciplinary hearing would be held, Dean relocated to New York and did not contest the charges against her. Dean had used unscientific methods of testing such as hair analysis, Vega and Interro testing, iridology and reflexology as well as treatment not medically indicated and of unproven value, such as homeopathy, colonic irrigations, coffee enemas, and rotation diets. Naturopathy is a cornucopia of almost every quackery you can think of. Be it homeopathy, traditional Chinese medicine, Ayurvedic medicine, applied kinesiology, anthroposophical medicine, reflexology, craniosacral therapy, Bowen Technique, and pretty much any other form of unscientific or prescientific medicine that you can imagine, it’s hard to think of a single form of pseudoscientific medicine and quackery that naturopathy doesn’t embrace or at least tolerate. -She has a website (Dr. Carolyn Dean, MD,ND, The Doctor of The Future) where she incessantly promotes magnesium as the cure for all ills. -She has written a book called “The Magnesium Miracle” (hmm. wonder what that’s about). -She sells her own (really special!) type of magnesium (see red flag #1 of quackery). -She writes for the Huffington Post (I’m considering making this a red flag of quackery). -She is on the medical advisory board of the Nutritional Magnesium Association (an organization devoted to hyping magnesium as the cure for all ills and featuring all manner of magnesium quacks). Reader’s Digest is not alone in allowing the advice of pseudoscience practitioners to stand side by side with legitimate sources. It’s getting harder and harder for the lay public to sort out real from fake health stories and advice. When seemingly legitimate news media and widely followed sources like Reader’s Digest and Prevention Magazine either consciously or inadvertently promote quackery, the truth becomes even more illusive. Profits from selling vitamins and supplements. Utilizes or promotes naturopaths or other obvious quacks as experts in health advice. 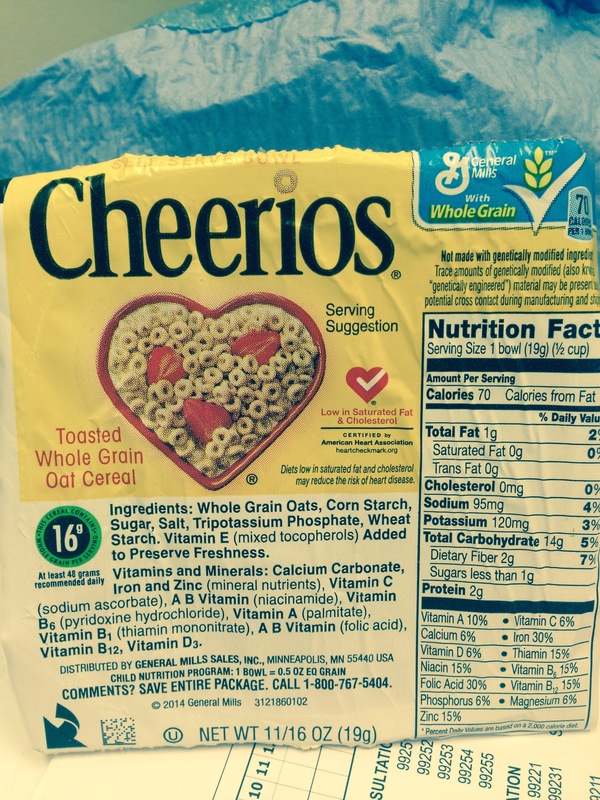 Cheerios and Honey-nut cheerios were the #4 and #1 breakfast cereals in the US in 2013, generating almost a billion dollars in sales. Both of these GM blockbusters undoubtedly have reached their popularity by heavily promoting the concept that they are heart healthy. Should We Be Treating High Cholesterol or Preventing Heart Disease? However, the critical question for any drug or dietary intervention is does it prevent atherosclerosis, the root cause of heart attacks and strokes. There has been in the past an assumption that lowering cholesterol by any means would result in lowering of atherosclerosis. This theory has been disproven by recent studies showing that ezetimibe and niacin which significantly lower LDL do not reduce surrogate markers of atherosclerosis or cardiovascular events any more than placebo when added on to statin drugs. The recently revised cholesterol guidelines endorse the concept of treating risk of atherosclerosis rather than cholesterol levels. If you follow Michael Pollan’s simple dictum you will get plenty of fiber, soluble or otherwise and you will avoid the necessity to obsess over the macronutrients in your diet, fiber or otherwise. Throw in some cheerios and oatmeal every once in a while if you like them, in their unadulterated state they are a healthy food choice. Wholesome foods in sensible combinations, as prevail in the world’s Blue Zones, seemingly take care of all nutrients, by focusing on none. Such dietary patterns can be low in fat, as vegan and traditional Asian diets tend to be; or high in fat, as Mediterranean diets tend to be. Variations on a common theme nicely accommodate personal preference, allowing us all to find a dietary pattern to love that loves our health back. The mechanism by which fiber lowers blood cholesterol remains undefined. Evidence suggests that some soluble fibers bind bile acids or cholesterol during the intraluminal formation of micelles. The resulting reduction in the cholesterol content of liver cells leads to an up-regulation of the LDL receptors and thus increased clearance of LDL cholesterol. However, increased bile acid excretion may not be sufficient to account for the observed cholesterol reduction. Other suggested mechanisms include inhibition of hepatic fatty acid synthesis by products of fermentation (production of short-chain fatty acids such as acetate, butyrate, propionate) ; changes in intestinal motility; fibers with high viscosity causing slowed absorption of macronutrients, leading to increased insulin sensitivity; and increased satiety, leading to lower overall energy intake. The modest reductions in cholesterol expected from intakes of soluble fiber within practical ranges may exert only a small effect on the risk of heart disease. For example, daily intake of 3 g soluble fiber from either 3 apples or 3 bowls (28-g servings) of oatmeal can decrease total cholesterol by ≈0.129 mmol/L (5 mg/dL), a ≈2% reduction. On the basis of estimates from clinical studies of cholesterol treatment,, this could lower the incidence of coronary artery disease by ≈4%. and a comment on publication bias: the finding that studies that do not show a positive effect of the intervention tend not to get published. Publication bias toward studies that showed positive results is always a potential issue in meta-analyses and could be operating in this study. If this were true, then the small effect estimates associated with intake of dietary soluble fiber would be further attenuated, further highlighting the need for conservative public health claims. The major benefit from eating fiber-rich foods may be a change in dietary pattern, resulting in a diet that is lower in saturated and trans-unsaturated fats and cholesterol and higher in protective nutrients such as unsaturated fatty acids, minerals, folate, and antioxidant vitamins.